Tarmon Gai�don, the Last Battle, looms. And mankind is not ready. The final volume of the Wheel of Time, "A Memory of Light, " was partially written by Robert Jordan before his untimely passing in 2007. Brandon Sanderson, "New York Times" bestselling author of the Mistborn books, was chosen by Jordan�s editor - his wife, Harriet McDougal - to complete the final book. 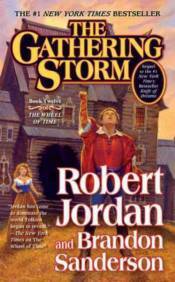 The scope and size of the volume was such that it could not be contained in a single book, and so Tor proudly presents "The Gathering Storm" as the first of three novels that will cover the outline left by Robert Jordan, chronicling Tarmon Gai'don and Rand al'Thor's final confrontatino with the Dark One. This short sequence will complete the struggle against the Shadow, bringing to a close a journey begun almost twenty years ago and marking the conclusion of the Wheel of Time, the preeminent fantasy epic of our era. In this epic novel, Robert Jordan�s international bestselling series begins its dramatic conclusion. Rand al�Thor, the Dragon Reborn, struggles to unite a fractured network of kingdoms and alliances in preparation for the Last Battle. As he attempts to halt the Seanchan encroachment northward - wishing he could form at least a temporary truce with the invaders - his allies watch in terror the shadow that seems to be growing within the heart of the Dragon Reborn himself. Egwene al�Vere, the Amyrlin Seat of the rebel Aes Sedai, is a captive of the White Tower and subject to the whims of their tyrannical leader. As days tick toward the Seanchan attack she knows is imminent, Egwene works to hold together the disparate factions of Aes Sedai while providing leadership in the face of increasing uncertainty and despair. Her fight will prove the mettle of the Aes Sedai, and her conflict will decide the future of the White Tower - and possibly the world itself.